According to the U.S. 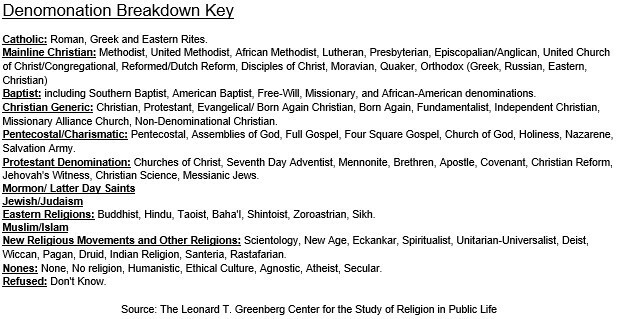 Religious Landscape Survey, conducted in 2007 by the Pew Research Center’s Forum on Religion & Public Life, Black Americans “are markedly more religious on a variety of measures than the U.S. population as a whole.” It cited that 87% of Blacks (vs. 83% of all Americans) are affiliated with a religion. It also found that 79 % of Blacks (vs. 56% overall) say that religion is “very important in their life”. Many scholars estimate that 15-30% of Africans imported as slaves were Muslim. 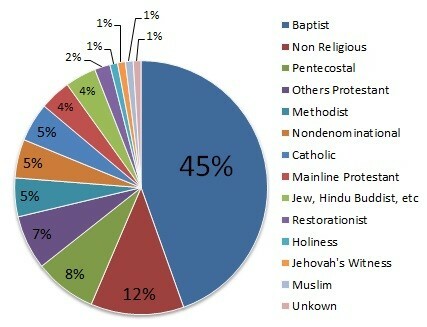 The majority of the remaining practiced indigenous forms of worship. All were converted to Christianity. Most became Baptist although slaves from Louisiana became Catholic because of the French settlers in that area. Today 83% of African Americans are Christian, and only 1% identify themselves as Muslim. According to the data published by The Leonard T. Greenberg Center for the Study of Religion in Public Life, the African American population has been shifting over the past 18 years. In 1990 half (50%) of African Americans considered themselves Baptist. However that percentage dropped to 45% by 2008. 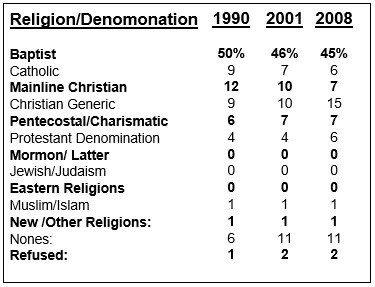 There was also a substantial decrease in the percentage of Mainline Christians (Methodist and Orthodox) from 12% in 1990 to 7% in 2008. Increases are seen in the Generic Christian category (non denominational, evangelical) and the none category (none, agnostic, atheist).